Used to add a layer of protection to a exposed entrance, electric security shutters are a great way to add an automated security system to a building. Depending on what it will be used for, you may choose a certain design. For example, office/commercial use shutters have police and insurance approved specifications which is useful for these types of businesses. Like mentioned, the shutters can be installed in front of the entrance. This then acts as a second layer of protection, which can be pulled down when required. Security shutters are perfect for domestic, industrial or commercial use with a vast range of colour choices and fixed or remote access control options ensuring the easiest and safest control methods. The shutters can be integrated into a home automation or independent control system if required. 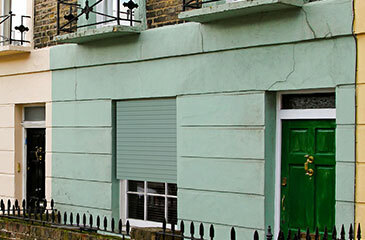 Security shutters are often bespoke made according to the size of the entrance, providing security for high risk through to lower risk protection.